The first step of the hatching process is to determine what your end goal is. If you don’t have specific talents in mind, it will be hard to know when you have finally trained your dream pet. If this is your first pet, I recommend going for what is known as a triple/double. The talents for this type of pet will be 2 universal resist talents, 1 universal damage talent and 2 school specific damage talents. I like to start with this type of pet for a few reasons: First, it’s the most versatile pet. It helps you while questing at any level and can also be used in PvP. Second, it causes you to build base pets along the way that can be useful for creating other pets later on. Here are examples of a myth triple/double and an ice triple/double, the type of pet the talents are on doesn’t matter, as long as it has these talents, it is a triple/double. If you view a pet on the pet tab, there are few different sections to look at. I’ll try to break down the important parts to look at and what they mean. When you first open your pet tab, I recommend clicking the Full Talent View at the bottom to show you all of your pet’s talents as opposed to just the manifested talents. This tab shows you everything you need to know about your pet. You can click on “Talents” and “Derby” to change back and forth between combat talents and pet derby talents. Pedigree – the pedigree is the rarity of all of your pet’s talents, normal and derby combined, + 1 per talent. Unfortunately, it doesn’t tell you much about the pet, because a higher rarity talent isn’t necessarily a better one. Manifested pedigree – this is like regular pedigree, but its only for your manifested talents. Also like regular pedigree, its not very useful except that this is how the hatching kiosk organizes pets. More on this later. Stats – stats are determined when the pet is hatched. Each stat influences the final value each different talent can give you. For instance, damage talents such as pain-giver are calculated using this formula (2*strength + 2*will + power) * 2/400. Each talent has its own formula, but certain types of talents are always calculated using the same stats. Selfish talents are talents that increase the maximum value of your pet’s stat(s). The maximum stat values without a selfish talent are 255 strength, 250 intellect, 260 agility, 260 will and 250 power. Pets with these max stats are known as 2.0 pets. The first place you should go to look for a pet to hatch with is the hatchmaking kiosk located outside of the hatchery. This kiosk allows people to put their pets inside for others to hatch with in return for hatching peppers. It’s unlikely to find the perfect pet you’re looking for in the kiosk, but it’s a great place to start. It still costs the same amount of gold for you to hatch through the kiosk and it functions identically to hatching with another player directly. The easiest way to find the pet you’re looking for is to enter the kiosk, go to “Browse Pets”, and find the type of pet you’re looking for. In this example I selected a clockwork paladin, so the kiosk will display all of the clockwork paladins it has at this time. The kiosk organizes the pets in descending order by their manifested pedigree. Things worth looking at are the item cards the pet gives, the stats the pet has and the talents in the pool both manifested and unmanifested. Some pets give cards innately, these are known as item cards and function identically to cards given by other pieces of gear. Some pets give their cards at baby while others require you to level up the pet to unlock the cards. These cards are tied to the type of pet. So, all clockwork paladins, for instance, will give the clockwork minion spell. Certain pets can be put in the kiosk but will require crowns to hatch with unless you already own that pet. Some other pets aren’t available for hatch making at all, these pets will have a corresponding tag on them. I recommend avoiding crowns pets if you can or just hatching with these pets directly through a player. So at this point, you should have an idea what kind of pet you actually want. Assuming you do, now it’s time to start looking to hatch. Look through your pets to see if you have any that have one or more of the talents you are looking for manifested already. If you do, look for either the pet with the most ideal talents manifested or the pet with the highest stats. If not, I recommend starting with a Wizard City first generation pet. First generation pets are pets obtained in the world that have never been hatched. These pets will always have the same talent pool and stats but do not always manifest the same talents. These are nice for a few reasons. For starters, you know exactly what talents are in its pool and where they are located which makes them easy to track. In addition, most of these talents are much easier to replace because very few pets you’ll be hatching with have them already in the talent pool. The best-case scenario would be to find the exact pet you’re looking to get to hatch with. However, that’s not always available when you aren’t lucky enough to have a helpful friend. So, the next best thing you can do is find a pet that has at least some of the talents you’re looking for. The tricky part is, you also want to make sure it has none of the talents you don’t want. Otherwise, those talents will be more likely to manifest in future generations. So, for example, if you wanted to make the triple/double from before you could look for a pet that has pain-giver and spell-proof to start. Once those talents manifest you could then look for a pet that has some of the other talents you are looking for. Continue doing that until your pet has all the ideal talents within its pool. Pets in the hatchmaking kiosk go on cooldown for one hour when hatched with and are completely removed from the kiosk after they’ve been hatched with 10 times. Players whose pets are hatched with through the kiosk receive one hatching pepper reagent each time someone hatches with one of their pets. Now while it might be tempting to hatch with the pet you want and train it straight to mega that’s a risky plan of attack. There is a “strategy” for creating pets known as base pets which make excellent checkpoints along the way. A base pet is a pet that has some of the talents your ideal pet wants with no bad talents manifested. This allows you to always have a pet to hatch with without introducing bad talents to the pool. If you were to train your base pet further, and it manifested a talent you didn’t want, you wouldn’t be able to hatch with it without risking the newly manifested talent showing up in the offspring. If on your journey to creating a triple-double, you train a pet to ancient and it manifests three talents you want, it would be wise to not train that pet any further. Instead hatch with it again as an ancient base pet. Then, if that offspring makes it to epic with four ideal talents, you could either hatch again or train it to mega. If the newest hatch fails, you can go back to the ancient base pet and hatch again. This could seem like a waste of resources at first because there’s a chance that ancient pet could have just been perfect had you trained it to mega. Let’s look at energy cost to show why I recommend this method. As you can see, not only does the energy cost go up, but the amount of xp you need goes up too. This means training a pet from epic to mega is significantly more expensive than training a pet from adult to ancient. This is why I recommend having at least an ancient base pet before pushing to mega, some people like to be extra safe and use an epic base instead. While the hatchmaking kiosk I mentioned earlier can be a great way to get started on your perfect pet, I wouldn’t suggest relying on it entirely. Since pets go on cooldown every time they’re hatched with and get removed after 10 hatches, you’re banking on the fact that you’ll get all the hatches you need to complete the project. Because of this, your goal should be to become self-sufficient as soon as possible. This means getting all of your ideal talents manifested on two base pets. Ideally both ancient, the older the better. Once you do this, you can self hatch instead of using the kiosk. This way you are no longer at the mercy of the owner of the pet you desire, so you can hatch anytime. Another benefit is that your pets will have very similar pools. This makes preserving both stats and talents much easier and reduces the risk of accidentally introducing new talents to your pool. The safest way to use this method would be to have two epic bases. They should both have three of the same talents you want, then each should have one of the last two talents you want. For example, if you were making the myth triple-double from before, one epic base might have spell-proof, spell-defying, myth-giver and myth-dealer. The other base might have spell-proof, spell-defying, myth-giver and pain-giver. As you can see, ¾ of the talents overlap between the pets, making them likely to manifest in the offspring which reduces the risk of a bad talent manifesting. Once your pet reaches ancient, it unlocks a jewel slot. Pet jewels, or star jewels, in most cases just function as a sixth talent. While the jewel slot unlocks at ancient, different jewels require your pet to be different ages to socket them. For example, a Wisp Bonus Opal only requires ancient+ while a Spell-proof Opal requires ultra+. You will not be able to socket a jewel if your pet already has the same talent manifested. Most Wizards don’t socket an ultra jewel, because training a pet to ultra does not grant you an additional talent, it only allows ultra jewels to be used. If you socket a jewel and then the pet manifests the same talent, the jewel will remain on the pet but you will not get the effect it provides. When this happens you have to shatter the jewel to place a useable jewel in the socket. There are many places to get jewels, but most school specific jewels can be crafted using the crafting recipes from Lowe Springfield in the Pet Pavilion. Opals, special jewels that give universal talents, are dropped from enemies or gathered from Jewel Blossoms. Kroger jewels have unique talents and give two talents per jewel, but can only be obtained by a select few Wizards. The bare minimum you would want to do before training a pet to mega is getting 5 ideal talents in the pool. There is something called a “clean pool.” A clean pool means introducing talents that would allow you to make a different pet accidentally. 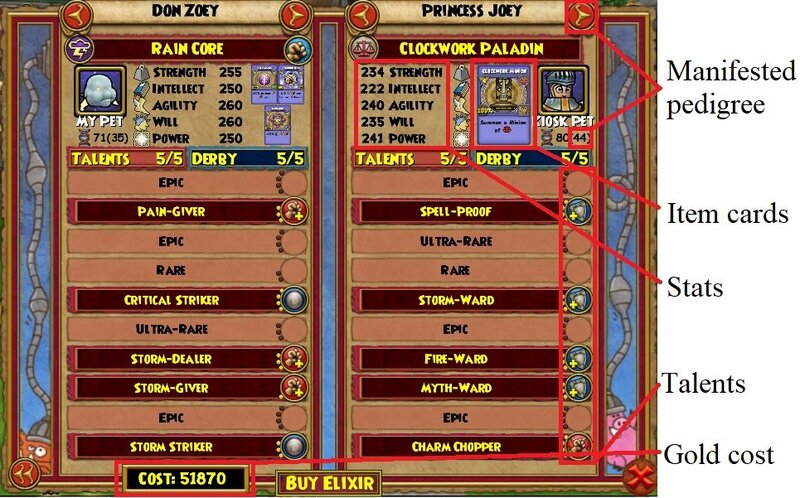 For example, in your triple double pet’s pool, you may want to include pain-bringer, mighty or piercing talents. While manifesting those talents wouldn’t necessarily give you the pet you want, you could accidentally make a quad/proof or a piercing pet. Going for clean pools usually takes a lot more time and effort but a single clean pool can allow you to create a handful of pets using the same base. Clean pools will not make it easier for you to obtain a specific pet. The purpose of a clean pool is to give your fails a chance of being useful. If you are just trying to make one specific pet, clean pools will not help you. Each snack gives a variety of stats and counts as experience towards your pet’s next level. 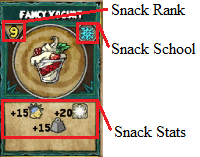 The snack rank gives you a general idea of how much xp the snack gives. Snacks rank 8+ are “mega snacks” and give 25+ experience. Each snack also has a school and type associated with it. The types are fruits, vegetables, meats, munchies, candies, desserts and cereals. If the snack school matches your pet’s school, your pet will like the snack and will gain +1 extra experience. Each pet also has a specific snack type, if the snack you feed them matches that, they will also like it and gain +1 experience. If both the snack type and the snack school match your pet’s, your pet will love it and gain +2 experience. Arena Tickets – you can purchase rank 8 mega snacks from Broc Connery in the pet pavilion for 50 arena tickets each, which can be useful in a pinch. House Gauntlets – Winterbane and Pagoda are both decent ways to get some rank 8 mega snacks. It requires combat so you need to be a decent level or bring a friend who is. Mirror Lake – the final dungeon of Zafaria, Mirror Lake gives two rank 8 mega snacks when you complete it. The dungeon also offers other loot and the snacks drop every time. Gardening – by far the best method for obtaining mega snacks, but also requiring the most prep. I recommend setting up a full garden from the start so you don’t spend more time gardening than pet training. Couch Potatoes and Evil Magma Peas both give rank 9 snacks at elder which are some of the best snacks in the game. You may notice some stats show one thing on your character sheet but do not give the full effect in combat. This is due to “fake stats.” These occur because the character sheet adds common values and then rounds values greater than 0.5 up, but the combat calculator adds common values and then does not round. Piercing talents are the one exception and they actually round down to the nearest whole number for combat. For example, the formula for calculating the value of armor-breaker is (2*strength + 2*agility + power) * (5/2000). 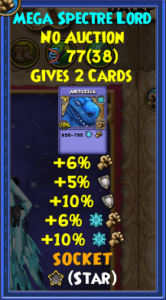 Which for this pet calculates to 3.5 and shows as 4%. The formula for calculating armor piercer is (2*strength + 2*agility + power) * (3/2000). For this pet that calculates to 2.1 and shows as 2%. However, the combat calculator adds these two values together and does not round them. So 3.5 + 2.1 = 5.6 which means in combat I only get 5% effective pierce. For all talents other than pierce, the individual rounded talents are displayed on the pet, the rounded sum on the character sheet, and the exact decimal value is used in combat. This means the difference between 9% damage and 10% damage is often smaller than it looks. What is pedigree and should I care about it? Pedigree just tells you the rarity of the talents in the pet’s pool. However, a higher rarity talent is not necessarily better, so in most cases you can just ignore it. What kind of pet should I make? The most standard pet you could make is a triple/double. For pvp ward pets are popular and for pve critical pets are popular. What pet should I put my talents on? The safest bet is either an enchanted armament or a pet with a blade as they will always be useful. How long does it take to make a pet? It varies a lot depending on what your starting pet is, what the pet you’re trying to make, how much energy and snacks you have and of course luck. When two pets are hatched, the offspring rolls each stat individually. Each stat has a 25% chance to be equal to parent A’s; 25% chance to be equal to parent B’s; and a 50% chance to be the average of both parents. This means the only way to get a max stat is by hatching with a pet that has a max stat and that if both parents both have max stats, the offspring will always have max stats as well. How does someone’s pet have an 11% damage talent or 11% resist talent? The only way to get stats that high is to have a selfish talent. If a selfish talent is manifested instead of socketed as a jewel it won’t appear but will still affect the pet. Why is a max stat pet called 2.0? 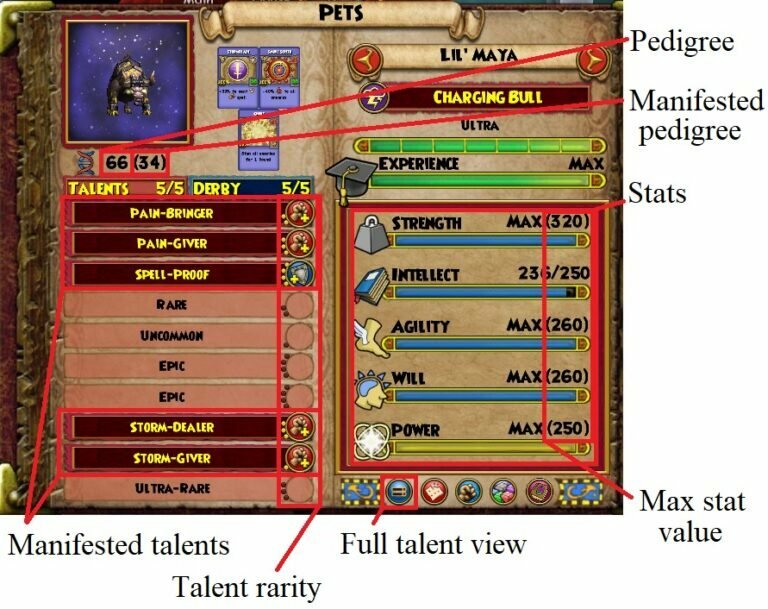 The original max stats a pet could have were 250 across the board and that was known as 1.0. However, since then higher stats have been introduced, and the new max stat values are now referred to as 2.0. What are these weird names for pets? You neglected to mention the Test Realm. The Test Realm is a useful tool when checking a pet’s next manifested talents. Hello, thanks for reading through my guide. I chose not to include the test realm due to how rarely test realms are available. However, if you happen to be training a pet while a test realm is active, you are correct that using test realm to check what talents your pet will manifest is a useful tool. I may cover this topic in a future guide, but for those looking to just get into pet training, I do not think it is essential information. Thanks for giving it a read, glad it was helpful to you. This is a very helpful guide to start pet hatching. I would love to see you also include what the talents are, as far as epic, ultra rare, rare, common and uncommon. The position value the talents hold and how to read the talents before the pet is trained. That would bring all the pet hatching anyone would want to know to Ravenwood Academy. Can you elaborate on what you mean by including what the talent rarities are? Do you mean the rarities of the talents I listed as examples? In regards to a guide on talent position values and how to read pet pools, if there seems to be enough demand for a guide like that I would certainly consider writing one. When your pet reaches ultra, you are given a jewel that gives a selfish talent, generally referred to as a selfish jewel. Selfish talents are covered under the stats section of “The Pet Tab”, but these talents increase one or more of your pet’s stats, which determine the values given by other talents.